There are more EU nationals working in the NHS than ever before. Really. Not only are there more EU Nationals in the NHS than ever before, there are more since the Brexit vote. This is an update on my two previous major posts on the NHS and European Union nationals. If you haven’t already. I recommend reading at least Part 2 to catch yourself up. 1. 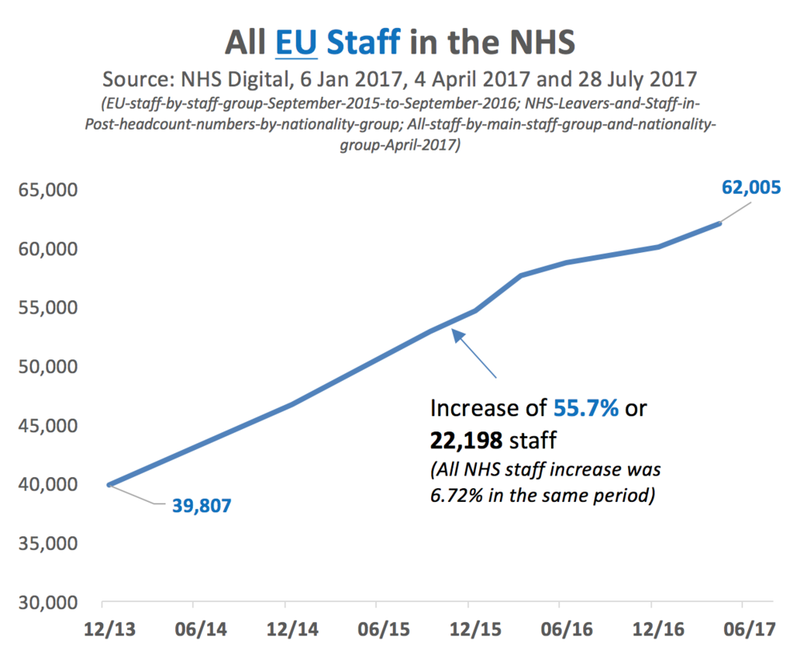 There are more EU Staff working in the NHS: instead of EU Nationals “leaving the NHS in droves” following the Brexit vote of June 2016 - as it is commonly alleged in the media - the opposite happened: they increased - both in number, and as a % of the staff in the NHS. 2. The NHS is not unusually reliant on EU nationals: The NHS is 24% less reliant on European Union nationals than the wider UK economy - not unusually or uniquely reliant on them (this should be uncontroversial as it is confirmed by the Office of National Statistics and the UK’s Independent Migration Advisory Board). This is of course not the same as not being reliant on EU Nationals at all, or not being grateful for their contribution to the healthcare service and the nation. 3. 'Xenophobia' has almost nothing to do with Brexit or the NHS & EU Nationals: It is almost logically impossible for actual “xenophobia” to be responsible for any NHS significant staff changes since the Brexit vote as non-EU foreign nationals from the rest of the world (Africa & Asia mostly) massively increased at the same time. No one has proposed a mechanism where racism applies to Lithuanians but not Nigerians. These conclusions were largely based on analysis of primary source data directly from the NHS and on the record comments to Parliament by NHS employer organisations. By contrast, the vast majority of mainstream coverage and commentary on social media about the NHS and EU Nationals made alarmist claims either with no evidence at all, or distorted the evidence. Both Part 1 and Part 2 gave many examples of this, showing that much of this alarmist coverage was supported by NHS unions, professional bodies for Nurses and Doctors and many political parties. But that doesn't make it true, absent any evidence. So, where do we stand 5 months later, and nearly 15 months on from the Brexit vote? Who is right? Are my conclusions still valid based on the latest information available from the NHS? In this post, you can find the evidence for these statements (taken entirely from the NHS’s own data) and once you see they are true, you can start making them for yourself! The big picture context on staffing overall first: the number of NHS staff has increased by 6.72% in the last 3.5 years, more than twice the rate of all UK Population growth. This is +74 thousand more NHS staff. These are net figures, taking into account new starters minus leavers. For scale that is about half the entire population of Oxford putting on an NHS lanyard. Note: Claims are regularly made in the media that there is a “shortage” of “30,000 Nurses" (just Nurses) - granting that this exists for the sake of argument, had this “shortage” been filled, 100K+ net new staff would have been added, and the increase would have been 9.42% instead. The cost of the additional 30,000 would be ~£1 billion a year. Again, big picture first. EU Nationals have risen by 55.7% over the last 3.5 years - a growth rate more than eight times faster than non-EU staff. These numbers are also true for EU Nationals as a percentage of the workforce - however, EU nurses did come down from a peak in April and their growth seems to have stalled. The total number of Nurses - all nationalities, including British - has fallen slightly between Apr-May 2017, which is quite unusual. Numbers are still up 2.9% from 2013. This could be a short-term blip between 1-2 months, or the start of a sustained trend. While the % of EU Nurses has more than doubled in less than 4 years, they have definitely slowed down and their growth has now stalled and looks likely to fall. UK nationals are showing a strong upward trend, Rest of World are also higher than before the Brexit vote. So, there do appear to be some Nursing staffing issue(s) - given it is the only speciality showing a reduction in staffing levels across all nationalities, and most others are showing strong growth. But - these are not caused by or EU/Brexit specific (as both RoW and UK Nurses have fallen as well, and other EU specialities are still growing, including Doctors). At most you could say a slowdown in EU Nurse growth has exacerbated other staffing issues. It would be preferable if the media, politicians, the Royal College of Nursing (RCN) and Nursing and Midwifery Council (NMC) focused their attention on the root causes of these staffing issues, instead of trying to fruitlessly tie these issues to the Brexit result - since misdiagnosing the cause of the problem means it is less likely to get resolved, with negative effects for patient care. The mainstream coverage of NHS and EU Nationals issue certainly hasn’t gotten any better in the last few months. The biggest media failing is that virtually all of the facts in this post are almost entirely unknown by the majority of the British & European public. In fact, many probably think the opposite is true. Regardless of your position on Brexit, most honest people would agree that in order to come to the right decision on critical issues like the NHS, we need to have a mutually agreed set of facts, and these facts should be based on evidence. Instead the coverage is misleading and full of alarmist scare stories (see 'Scare Stories' at the end of this post for an analysis of just the two most recent ones). Why is the media coverage so consistently wrong? Why is it consistently wrong in an alarmist direction? Why do many NHS organisations and politicians not correct this coverage, but fan its flames instead? The conclusion I've come to is that much of the media (and those who feed them stories) are opposed to Brexit and are prepared to use the NHS as a weapon to undermine the result - even if that means unnecessarily scaring EU Nurses and Doctors with misleading stories about xenophobia and their colleagues "leaving in droves". The leaders of NHS organisations and major politicians probably think having a 'crisis' will help them get additional staff or funding, or enable them to dodge criticism for any healthcare scandals. And the vast majority of the public are probably genuinely concerned about the NHS and the effect of Brexit - but only because they don't know the facts and are bombarded with scare stories on a near daily basis. And rank and file NHS staff are probably just trying to get through the day! There are more EU nationals working in the NHS than ever before and overall, more NHS Staff than ever before. The media's failure to report these facts due to their partisan bias is immoral, and using the NHS to undermine the Brexit result is very dangerous. This landed simultaneously in The Guardian, BBC, Independent, Telegraph, Sky News, Daily Mail and HuffingtonPost (the original source was the independent Health Foundartion). The crux of the story is that EU nationals registering with the Nursing and Midwifery council (NMC) has fallen by 96%. Unbelievably, none of the stories mention the full context of the actual number of EU Nurses working in the NHS before and after the Brexit vote, which is some feat considering that is what these articles are presumably about. And most were written by Health Correspondents who should know better! No goal is ever specified and change is assumed to be a priori bad - What is the right number or % of EU staff that should be working in the NHS? No-one in these articles ever asks this question, or gives an answer. Why is EU Nurse numbers falling from 6.9% bad, when only a few years ago they were less than half this at 3.22%? Are they supposed to grow forever, or never change? Why are EU nationals implicitly better than other Rest of World nationals? Shouldn’t healthcare be based on patient care not the nationality of the healthcare professional? They often conflate EU nurses with all EU staff - The articles almost never say what is happening with EU Doctors, or EU support staff, only Nurses - yet always draw conclusions that are about EU staff in general. 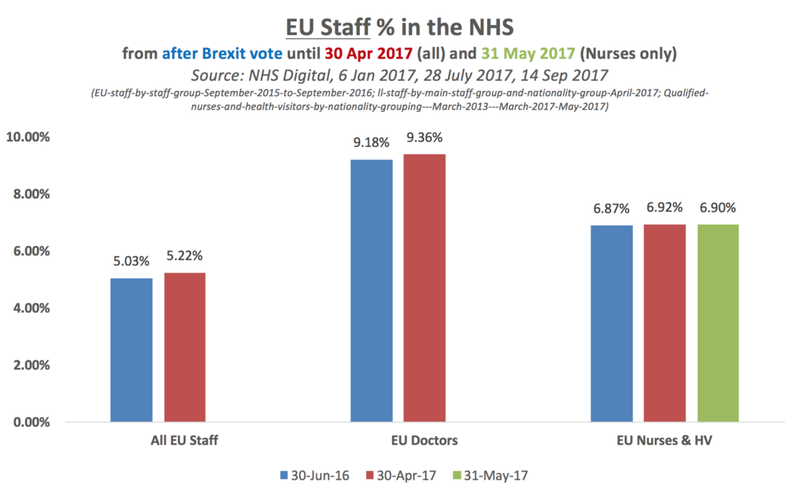 Knowing that EU Doctors and Support staff are rising faster than Nurses would provide much needed context, but it is almost never provided. They always conflate Nurses being registered with the NMC with joining or working in the NHS. While it is true that you can’t work in the NHS as a Nurse without being registered with the NMC - so this would be a good “canary in the coal mine” for staffing issues - those two things are not exactly the same. For example, you could leave the NHS and return whilst remaining registered with the NMC, or have registered before but not yet joined the NHS. You can also move between a social care setting and a hospital setting. You can be awaiting English Language certification and not yet on the register (this one is sometimes mentioned). There are ~35,000 EU Nationals registered with the NMC, but no more than 21,919 working in the NHS, so further new registration may not be required for immediate hiring. And so on. They conflate EU Nationals with “Foreigners” and “Foreign” - This is systematic and demonstrates a bias towards thinking the EU is the most important place on Earth. 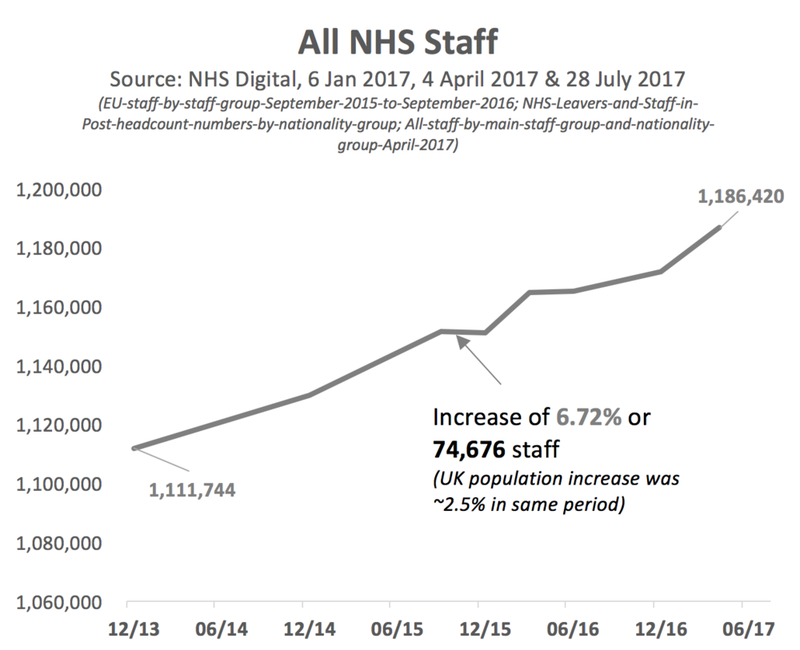 So, for example, many of the articles claim “xenophobia” towards “foreign staff”, whilst non-EU staff are not even mentioned, with the fact that the number of RoW nationals joining the NHS is accelerating is ignored or suppressed. They give no explanation for how someone can be precisely racist or xenophobic towards Lithuanians but not Nigerians. They use arbitrary dates for comparison - in these stories July 2016 is compared with April 2017, rather than July-July, or April-April, or year end/year end. This isn’t the first time, in Part 2 I covered how The Guardian compared new joiners to the NHS mid year with those joining in Dec (when most people do not join a new job in Dec, preferring January due to the holiday period). I believe these choices are deliberately designed to mislead and cherry pick data points given how frequently they happen. They make completely false statements - e.g. The Guardian states “NHS England announced it was launching a nursing training programme to help plug the gap created by the record number of Europeans leaving the health service since the EU referendum”. There is no ‘gap’, this is flat out false. 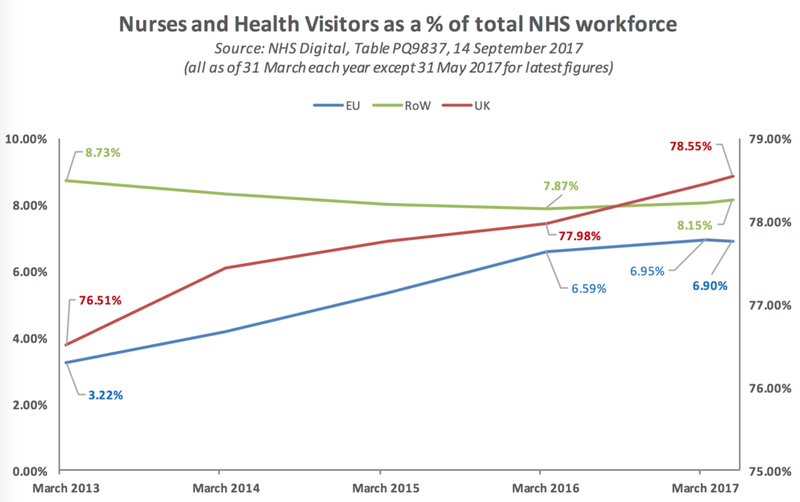 More EU Nationals are working in the NHS both in number and as a % than immediately after the Brexit vote, so only using the "leaving" figure is misleading in this context. They speak to transparently biased sources - e.g. The Huffington Post spoke once again with Joan Pons Laplana, an EU Nurse who wants to reverse the referendum result, and who claims to think he is on the verge of being thrown out of the country for his "different accent". Comically, he also thinks that EU workers are considering leaving the hell-hole that is the UK to go and work in - wait for it - Saudi Arabia instead. I have pointed out to him on Twitter the fact he has lived here for 17 years makes removal legally impossible, with no response. The accent/Saudi Arabia idiocy doesn’t merit further comment except to say it shows the irrationality of his thinking, which the media never points out. They publish little data or evidence, or rely on non-publicly available data - Very few of these types of articles include relevant historical data for context. And almost all are based on Freedom of Information Act requests (which can be crafted to only obtain certain data you want for a pre-ordained result), rather than just using the NHS’s own statistics. These requests are often made by partisan sources (The Liberal Democrats or NHS-linked quangos and businesses) and given to partisan media (e.g. The Guardian or The Independent), with the underlying data not made easily available for independent analysis. No explanation is given for ignoring the NHS data which is publicly available. This claim was based solely on a reporter for The Independent taking a photo with a telephoto zoom lens of a piece of paper being held by Health Secretary Jeremy Hunt on his way into 10 Downing Street. This piece of paper apparently contained revealing information about EU nationals and the NHS. “Hospitals [are] 40,000 nurses short” - The full context of the number of NHS Nurses rising over the last few years is completely omitted. No explanation is given for how these 40,000 Nurses could even be hired quickly since such a figure would be nearly double every single EU nurse in the NHS put together. “In recent years, hospitals have undertaken major recruiting drives across Europe in order to plug massive gaps. This was after hospitals had struggled to recruit British nurses after the coalition government cut nurse training places by 10 per cent in 2010.” - About the only claim that is remotely true is this one. Leaving aside “massive gaps” (since Nursing staff numbers continued to rise), it is true that training places were cut and insufficient numbers of British nurses were recruited. The NHS also started major recruiting drives outside Europe, which is not mentioned - the usual bias of thinking Europe is the most important place on Earth. In summary, the entire premise of The Independent’s article is ridiculous since the NHS openly publishes huge amounts of information about EU nationals staffing levels - no zoom lens required. Neither the newspaper/media outlet or the reporter in question seems to believe they have a responsibility to investigate NHS data before publishing outlandish claims that have no basis in fact about the NHS. This article still has no correction (I pointed them out to the author on Twitter and in the comments on the article) and yet The Independent is still considered a trusted source by many for information about the NHS. These were just the two I analysed - there were about another dozen scare stories - so I am sure you can expect more to follow in the coming months! If you spot one you want fact checked, please let me know on Twitter or in comments. Note: All figures and data are from information released by NHS Digital throughout Q1 2017 and up to 14 September 2017, and are for NHS England only. The dates chosen for comparison were chosen because they are the most up to date data available from the NHS, comparing to after the Brexit vote is a key question, and in Part 1 and Part 2 I already provided Year to Year comparisons. Note these % figures differ slightly compared to the previous posts on KingdomComment.com as I have not excluded ‘unknown’ nationalities from the figures. This was for simplicity and to aid researchers/journalists/readers in locating my figures in the NHS data more easily. I have done a comparison that excludes unknown nationalities as well and there is no difference to the conclusions - in fact the % of EU nationals rises with unknown excluded.